Larry travels a dark, dark road, going to a remembered but unpleasant, and what most dedicated Mac users might even say, scary place. Read on. I recently received a desperate email from a friend. In spite of his vow to never own one of those infernal Windows PCs, one apparently flew into his hands and he was unable to let go. Unfamiliar as he was with whichever operating system was running on it (an older Sony Vaio, so probably Windows XP), he needed to know how to locate the MAC (media access control) address in order to perform some operation with it that I now can’t recall. 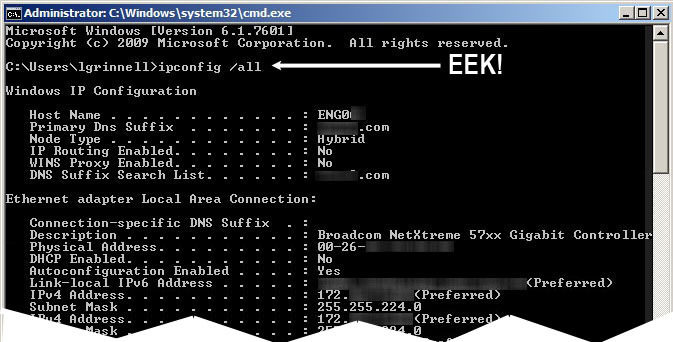 As a regular Windows user in my day job, and having held a now-lapsed MCSE (Microsoft Certified Systems Engineer – Windows 2000) certification, I immediately knew the easiest way to get that information: with the infamous command line. To make sure I remembered, I went to the Start button, selected Run from the window that popped up, typed CMD in that window and clicked the OK button. Suddenly it was 1985, and there was a lovely DOS (disk operating system) window — the thing nightmares are made of. But I digress. There it was, the lovely and much-maligned C:\ prompt. With quivering fingers (it had been a rough night), I typed in the arcane command from memory: ipconfig /all. Immediately the screen displayed a bunch of information about my network cards and network connections, including the elusive MAC address. Procedure confirmed, I emailed my friend with the magical keystrokes, and found out later that he was able to get the information he needed with my email coaching, without further ado. Then, I got a written lecture about the evils of command line computing from someone who has been an exclusive Mac user since the very beginning — yeah, the same guy — talk about biting the hand that feeds you! He moaned about how difficult it is to find this information and what a terrible thing it is to not be able to move a cursor around with a mouse and click on pictures. Don’t get me wrong. I, too, have been a Mac user from nearly the beginning, but I cut my eyeteeth with Timex/Sinclair ZX-81s and Commodore 64s, so typing little characters on the screen wasn’t a big mystery to me. My first job in technical writing and publishing was on a PC, which I had to learn to use after being an exclusive Mac user for two or three years. This was in the day when a fully loaded computer had 640 kilobytes (not megabytes or gigabytes!) of internal memory, a 20-megabyte hard disk drive, and an Intel 8086 processor running at 4.77 megahertz (imagine!). While the publishing application used a rudimentary graphic user interface (GUI), this being a few years before Microsoft Windows became a viable operating system, we all had to learn the ins and outs of DOS. Commands like COPY, DELETE, FORMAT, and all the little filters to make them a little more powerful. Gee, why didn’t they just give us stone tablets and chisels? Well, the command line is alive and well, though mostly hidden from the average computer user. In the back rooms and basements of corporate America (and elsewhere), information technology (IT) professionals use the command line to control huge servers, routers, and it’s truly the glue that holds the internet and most big iron computer systems together. For most cases, IT pros can use the command line to push software updates to a thousand computers in a few keystrokes that might take an application with a graphic user interface, if it were even available, much more time, and with less flexibility. Since the advent of MacOS X, even Mac users have had the ability to interact with their machines with command line instructions. To see (please don’t actually DO anything unless you REALLY know what you’re doing) what it’s all about, go to the Utilities folder (inside the Applications folder) and double-click Terminal. Okay, now that you’ve seen the command prompt, just type exit and then quit the application. On second thought, just go to File>Quit and never, ever go there again. Do not look behind that curtain! That little look inside the terminal is a tiny view inside the engine of MacOS X, an operating system called Unix. MacOS X is just a graphic shell on top of this scary command line stuff, and much of what you do with your mouse and little pointy, clicky things is really, in effect, typing weird Unix commands behind that curtain. Systems Administrators for Macintosh networks using MacOS X Server use those same command line instructions every day, and get the job done, and you know, God bless’m. They do it so you don’t have to. The plain vanilla version of MacOS X does it graphically so you don’t have to know those weird commands, and aren’t we all lucky and happy boys and girls for not having to look behind that scary, dangerous curtain. The increased memory, disk space, and processor speeds of today’s computers mean that most of us will never have to type a command line instruction, and even though a graphic user interface might be more inefficient, who cares? Computers are so fast today that the difference between a command line instruction versus a GUI equivalent is so miniscule that you would need sophisticated timing devices run by a computer to measure the difference. You will never see the difference in most regular use. Oh, and that MAC address question? On a Macintosh, go to the Apple menu, select About This Mac, click the More Info… button, click Network and you can see the MAC address of all of your network cards (wired, wireless, Bluetooth, etc.) in the right-hand column. This probably takes more time for even someone experienced on both platforms than typing the arcane ipconfig /all command in Windows. Will that convince you to abandon your Mac or your GUI for command line? I’m sure your response will be that ever-popular verb and pronoun. I know that would be mine.